The Democrat party is the party of EVIL !!! And they have partners in the GOP that are in favor of infanticide !! Why ?? Because they are all EVIL. They ALL worship Satan. They may as well put up their statues to Moloch to sacrifice children to Baal. The democrat party has much in common with the nazi's ! I am amazed at the number of people that claim to be die hard democrats, yet claim to be "washed in the blood of christ " Christians ?? That is absurd, the two positions are incompatible ! If left unchecked, they will not stop with abortion ! What / who will they want to sacrifice next? The infirm, those with disabilities, those in nursing homes, anyone they view as useless eaters, those with religions they do not like, conservatives, etc, etc, etc ! No wonder they want to confiscate our arms !! Never, never give up your firearms !!! 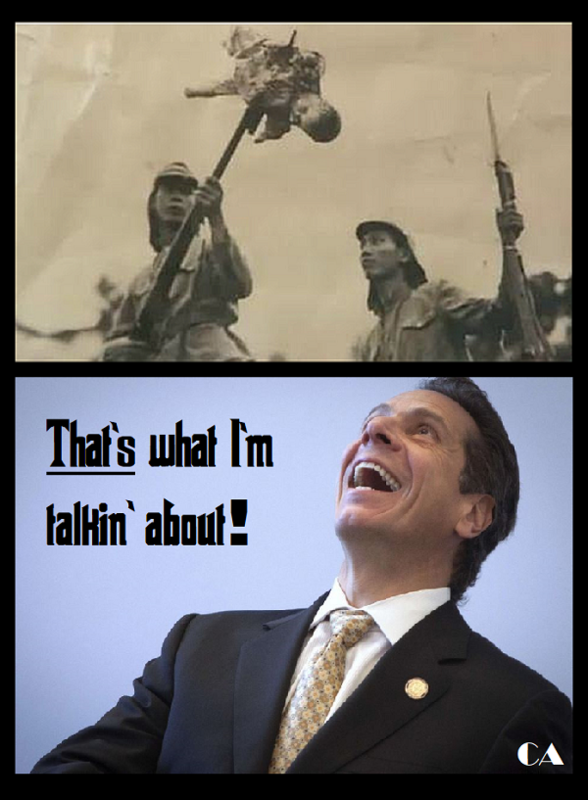 The picture you posted of cumo is very appropriate !!! Would apply to ALL commie crats !!! I only wonder why God the Father has not exterminated that group of satans followers !!?? THEY know as well we what the 2nd amendment was for. It was to combat the infernal central socialist government that our original SMALL government has morphed into. It continues to grow and the number of anti-gun, anti-freedom Congressrats has morphed into something that today contains less than one handful of true conservatives whose votes uphold the constitution.